I hope I can share a little of what I've learned - and there is so much more to learn. Let's learn to love dandelions! and all those wildflowers that are so helpful for bees. If you want to share anything, please post at https://www.facebook.com/gardenwithoutdoors/. I was trying to organise my pots and water every one in this dry weather and I see the stem of that honesty is enormous at the base. I'm wondering when it started. It looks like it's been growing for a while, I guess since last year at some point. That's why it's managed to get so big. I see Scarecrow has gone next door to lay in that space which I just cleared by pruning the cherry laurel. That huge stump to the left is left from it being cut down. As no one else pruned the shoots back I thought I better before it gets to huge tree proportions again. I asked my neighbour first so he wouldn't freak out at me being in "his" garden. He said "ok" - he has his moments. I also saw the anemone or ranunculus has buds (I always get the two confused - I'll have to check last year's photos and see if I can establish what this is). One pot is looking good the plants in the other pot has been stripped by slugs before I got it off the ground and hopefully away from the worst of the slug damage. Polly Pocket was attracted to it as well but she was too shy to come all the way down so I put a pot of catnip on the stairs for her. The only place I've seen pink-sorrel is a walled cemetary in east London. It's formed a perfect dome . Looking inside the dome, one can see why. All the stems are unbranched and grow directly from the ground. It is cold! so it's been difficult to do much in the garden but yesterday I started to do a bit and after working for a while I warmed up. I just had to pot up the last nepeta and that led to repotting some other things. I grew scabious Perfection Blue from seed last year. I got 5 plants from the packet of seeds (not terribly impressive) and they've been in pots since. These three highlight what happens to pots in my garden. They are invaded by self-seeders. Left, a large verbascum rosette has taken over. Two on the right, snapdragons which I like but they can't take over my scabious. There are violas there as well but hoping they are small enough to co-exist. I repotted each of those (and the two others in pots of their own. I left the violas with them. The pots are so large, I put the nepeta (new from Peter Nyssen) in with the scabious and another nepeta I had. It's small so I guess it's a nepeta cataria (catnip) I grew from seed but I'm not absolutely certain. In that pot behind, there's also scabious from the garden centre last year. I buy whatever I can in the "wildflower" range and last year they had small scabious and scabious columbaria? Thought they were selling them as two different plants. I'll have to check. Anyway that pot is full of scabious. To the left another large pot with a nepeta fassennii from last year. In the back, the beginning of the globe thistles on the right and in the centre a self-seeded veronica which also got a globe thistles - they will take over given half a chance but the bees so love them so I try to accommodate them in my garden, as many as I can. One of my more successful plants grown from seed. One my my hostas, in pots, shoots just showing. Of course, the pot is also being taking over my self-seeders, in this case forget-me-nots. Further back in the garden, the left flowerbed which I've tried to keep clear for other things but the green alkanet is encroaching and a foxglove has made itself at home. A few centaurea montana are left - the main plants I planted. I see another two globe thistles have self-seeded. I must move them or they'll take over. Red tulips left from last year. 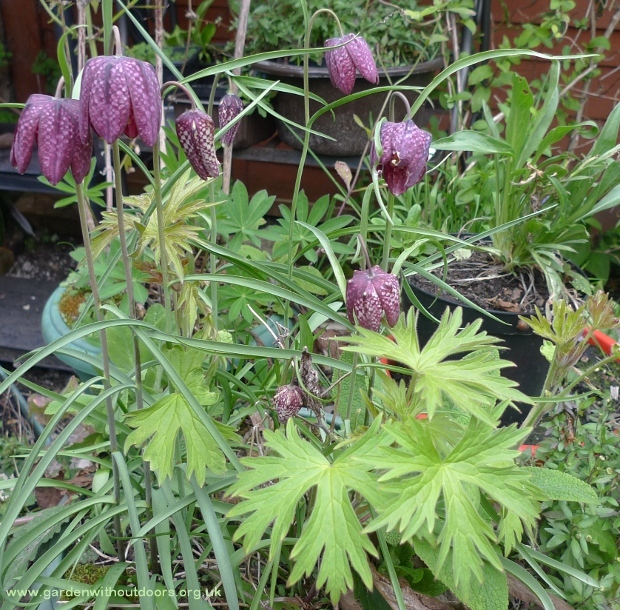 Behind on the left, monkshood - amazingly surviving from last year. I've had it before but it didn't survive. The honesty just starting to bloom, tulips from last year amazingly blooming (I don't find bulbs last too long), in the background lots of green alkanet, self-seeded violas and snapdragons. I found my ranunuclus corms. It's a bit late I think to start them but hopefully they'll catch up and bloom at some point this summer. I always love having pots of nepeta, as do the cats. Some nepeta left from last year are looking good but there are two fresh ones I just potted up (from Peter Nyssen, a bargain at 3 for £5.40 (I think)). My cat Scarecrow. It's the time of year when things are starting to grow and it may be unclear what's what. Self-seeders green alkanet, comfrey and foxglove are all quite similar at an early stage. Add to that lesser knapweed, centaurea montana and it can get quite confusing. 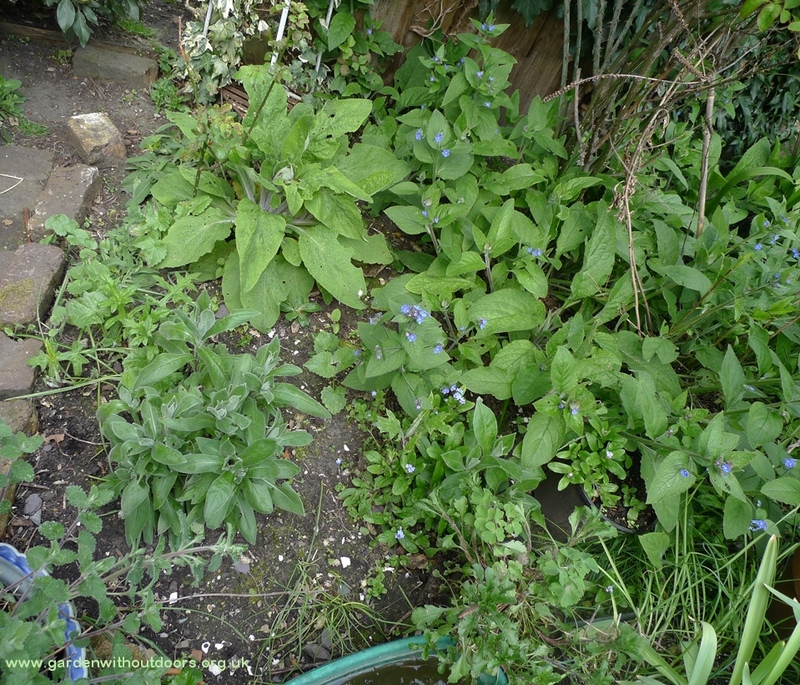 On the right with the longer leaves is comfrey. I know because it was there last year and the leaves are longer than green alkanet. On the left and behind to the right is green alkanet. 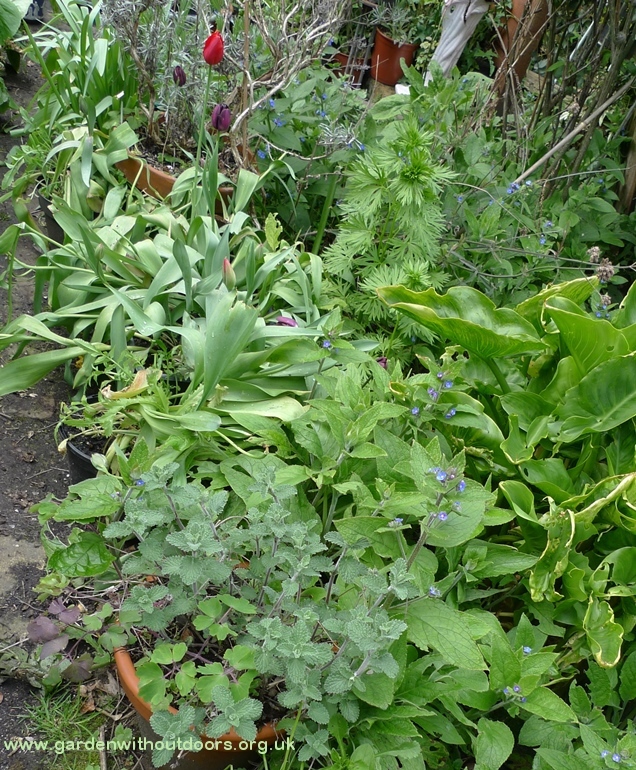 On the right green alkanet, especially easy with the blue flowers in bloom, foxglove in the middle at the back and centaurea montana at the front, large clump to the left and small clump to the right. Bluebells and hyacinths can get mixed up but by April 1st all the hyacinths are in bloom or have finished blooming. The hyacinths below are not great plants as they were previously forced and I only just planted them out. In the foreground below is a bluebell, not in bloom or even bud yet. It's one that got away, I've dug them all up from my garden as they formed huge clumps and got in the way of other things growing. 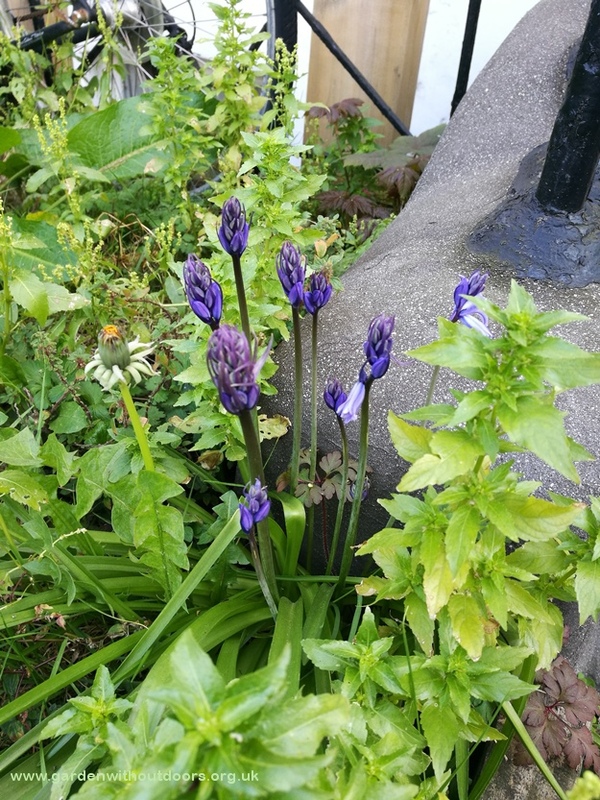 My neighbour has bluebells and in their garden, amongst the annual mercury and dandelions, they look nice. The leaves are longer and thinner than hyacinths. 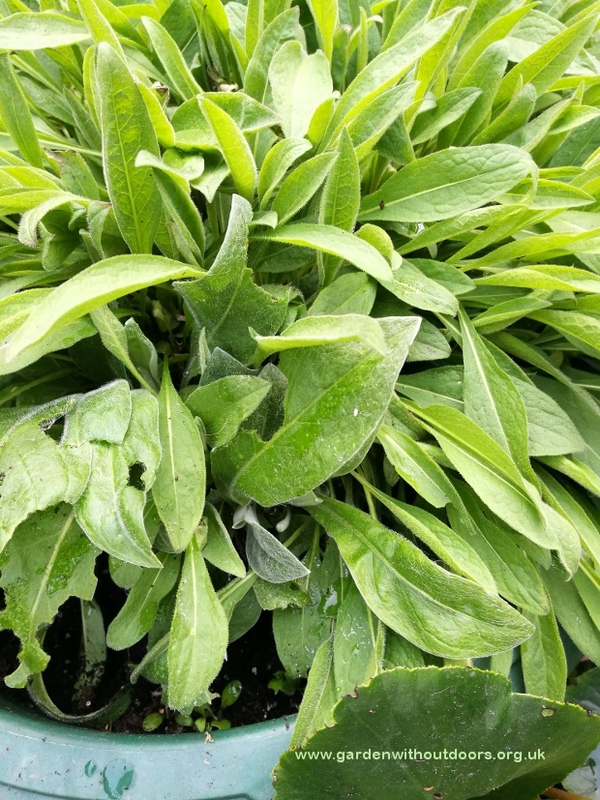 Cerinthe is one of those plants where you buy 1 packet of seeds and you have plants for life as they are a self-seeder but not invasive. All of these have self-seeded, last autumn and winter so they are ready to bloom early. This pot started off with a meadow cranesbill I grew from seed but lesser knapweed has taken over and a teasel has decided it made a nice home. Teasel is another thing I grew from seed and I never need another packet of seeds again. They pop up regularly everywhere. Results from seeds are so variable. I find things are either wildly successful or I can get only 1 plant from an entire packet of seeds. This pot and flowerbed reminded me of that today. The polyanthus are one of my more successful seed sowings, sadly not one of my favourite flowers, the seeds were just on sale. Self-seeded in the pot is a globe thistle. I got many plants from the packet of seeds and regular self-seeded plants ever since. I do love them as do the bees so they are a winner. To the right of the pot is my one greater knapweed (not to be confused with the artichoke with the large leaves). I've sown more than one packet of seeds but I don't think I got any plants. I think this lone one is a "wildflower" small plant from the garden centre. It's taken a few years to feel comfortable and I get a few flowers in a couple of flowerings in the summer now, or I did last year anyway. I love centaureas in general, greater knapweed in particular. Also to the right is a cerinthe which I always have self-seeding now. 1 packet of seeds, plants for life. A few are like that. I sowed echium vulgare seeds a few years ago and got 1 plant which I planted in the front garden. Then nothing for a few years. Last year I got another plant in the back garden, out of nowhere. I suddenly noticed this today which I think is an echium vulgare, in the front garden. The small plants around the edge of the pot are self-heal, a wildflower I love (pansy / viola in the middle, another of my favourite flowers). I planted the seeds end of last summer and got a few plants and the slugs had a few. I seem to have a few left. They're rather small so I don't know if they'll bloom this year or not. I haven't grown them before. I've been looking at so many rosettes recently, especially hedge mustard and shepherd's purse. The shepherd's purse bloomed first, there are lots in bloom now and no sign of that initial basal rosette. I saw my first hedge mustard in bloom yesterday. It obviously takes a bit longer to develop. This particular one I saw on St Pancras Way (22-2-2019) which is on my walk to and from the garden centre. It's right on the pavement so obviously pretty tough. everywhere seems to be being mown but this has survived as it's on the pavement away from overzealous "gardeners"
I've been photographing a lot of rosettes recently. I didn't need to go far yesterday to find more. My garden and the patio next door had some interesting ones.